SPRINGFIELD, Ill. — H.D. Smith has recognized pharmaceutical and health product manufacturers with its annual Trading Partners of the Year awards. Dale and Chris Smith of H.D. Smith. The drug wholesaler said each award category recognizes two winners — based on criteria including trade volume, trade policies and overall sales — for excellence across each key H.D. Smith product area. • Branded/specialty pharmaceuticals: Horizon Pharma USA Inc. and Boehringer Ingelheim Pharmaceuticals Inc.
• Generic pharmaceuticals: Alvogen Inc. and Apotex Inc.
• Health, beauty and wellness Products: The Emerson Group and Prestige Brands Inc.
• Home health care products: Veridian Healthcare and LifeScan Inc. The awards were presented during the 2016 H.D. Smith National Sales & Management Conference, which the company said emphasizes the company’s aim to support specialty and retail pharmacies and other trading partners in today’s fast-changing health care industry. H.D. 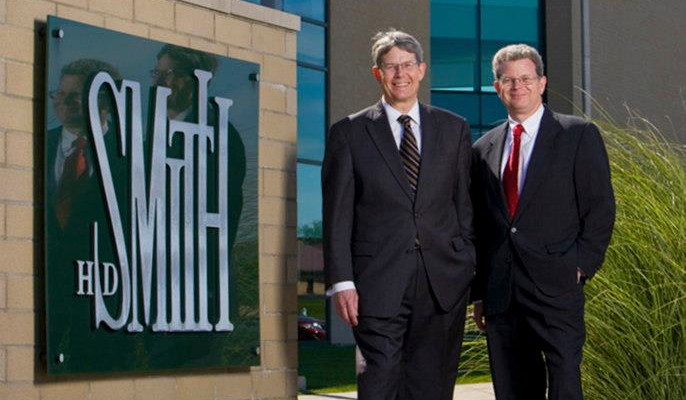 Smith is the nation’s largest, privately held drug wholesaler. The Springfield, Ill.-based company also operates CompleteCare Pharmacy, HDS Healthcare Packaging, Smith Medical Partners, Triplefin and Valley Wholesale Drug.